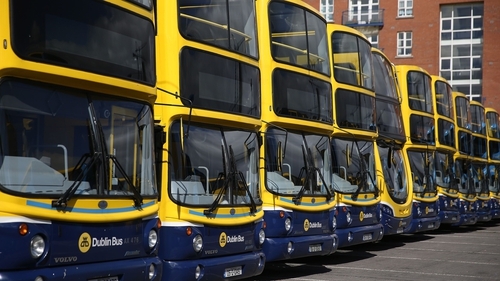 The Irish Small and Medium Enterprises Association has called on the Minister for Transport to instruct management at Dublin Bus to sit down and negotiate with bus drivers without preconditions. 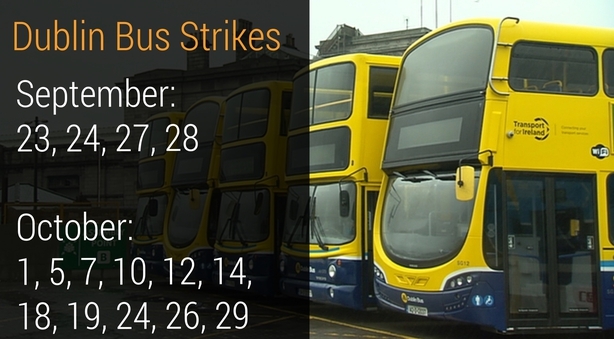 Hundreds of thousands of commuters in the capital face disruption again today, as Dublin Bus drivers stage a fifth day of strike action. The National Bus and Railworkers' Union has warned that unrest could spread to Bus Éireann and Irish Rail. ISME Chief Executive Mark Fielding said the stand-off at Dublin Bus has lasted too long and is costing businesses dearly. Speaking on RTÉ's News at One, he said that turnover is down and many staff cannot make it to work, or have to take taxis home late at night. He said ISME is not asking Minister Shane Ross to "open a chequebook" but rather to instruct management at Dublin Bus to get back to talks at the Workplace Relations Commission or the Labour Court. Labour leader Brendan Howlin has said the impasse in the dispute needs to be broken and accused Mr Ross of shrugging his shoulders and not responding adequately. The minister this week said he would not "ride in on a white horse in shining armour" with a chequebook to solve the industrial dispute. SIPTU's Divisional Organiser Owen Reidy also said that Mr Ross should instruct management at Dublin Bus to enter into talks with unions. Speaking on the same programme, he said that "something needs to happen quickly", describing the situation as serious. He said management at Dublin Bus should enter into talks without preconditions. Dublin Bus, meanwhile, has said the stoppages to date have cost the company over €4m and the halt to services today and tomorrow will cost an additional €2m. It said the dispute will leave the company in a loss-making position by the end of 2016. The additional 13 days of planned stoppages will cost the company a further €15m, Dublin Bus said in a statement. "This will have a catastrophic impact on Dublin Bus' financial position," the company said. Drivers at Dublin Bus are seeking a pay rise of 15% over the next three years. The company says it can only afford an 8.25% increase that was recommended by the Labour Court. It has urged staff to attend the Workplace Relations Commission for negotiations. Dublin Bus passengers face disruption until normal services resume on Sunday, with further strike action planned for next Tuesday, Wednesday and Saturday. Meanwhile, Bus Éireann staff are being balloted for industrial action, after the company revealed plans to change terms and conditions for employees on its Expressway service. The NBRU has also warned that unrest could spread to Irish Rail.